Earlier today, Hulu announced that they are teaming up with Facebook to let users interact with their friends better than ever before. Although Hulu has long had profile pages and lets account holders add others as “friends,” the extent of the social experience was rather limited. Even the share buttons below each video were beginning to get rusty. The new Facebook integration made a debut earlier today, but Hulu rolled back on the new feature set due to several critical bugs. When the feature goes live again, users can choose to log on to Hulu with their Facebook account if they choose to do so. 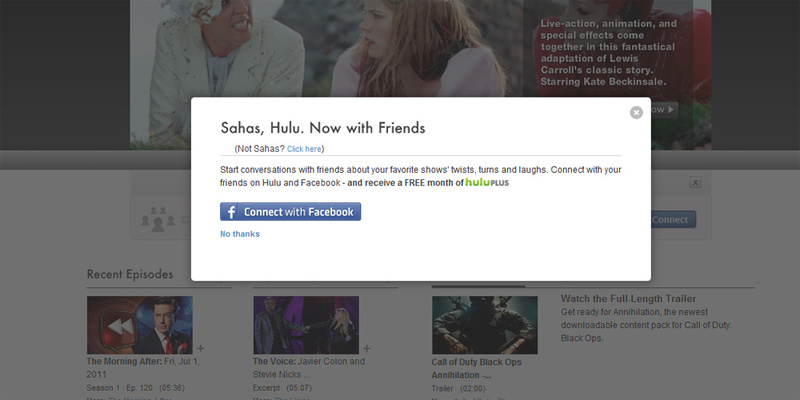 Hulu will even personalize the homepage for each use based on the interests of their Facebook friends. To promote connecting with Facebook even further, those who link both accounts will even get a free month of Hulu Plus. Other new features include the ability to let anyone comment on any specific moment of a video and share with friends. Those on Facebook can jump straight to the exact position of the show and respond as well. This is a great move for Hulu since conversations will inevitably drive more traffic back to their site. More importantly, I think this entire integration is great for discovering new shows. While a list of popular shows might do the trick for some, a list of recommendations from friends has more value. Hulu likely hopes that customers will begin paying $7.99 for a monthly subscription once the free month-long trial runs up. Having all your friends taking advantage of the service is a definite motivator for many. I would not be surprised to see Netflix follow in pursuit with their own social networking integration as the company moves away from physical DVD and Blu-ray rentals and heads to an all-streaming service. Over the past few days, several rumors regarding either Google or Yahoo making an offer to acquire Hulu have surfaced as well. Hulu even finally got around to releasing an Android app for select devices with support for more on the way. There is definitely a lot going on at Hulu and I just hope the good news continues as someone who never wants to go back to cable or satellite again.